AccuRna is pioneering unique drug delivery system (DDS) for nucleic acid therapeutics, both of short chain including ASO, siRNA, miRNA and long chain, mRNA as a therapeutic drug. Our aim is to promote therapeutic innovation in the form of nucleic acid medicine utilizing our robust DDS platform, providing effective treatmAccuRna’s drug delivery system provides a simple yet robust solution for any parties, including pharmaceutical companies, academic organizations and research institutions, who are pioneering nucleic acid therapeutics. Partnering and collaborating with those parties, we will unleash previously untapped potentials of nucleic acid medicines at AccuRna. Our business activity is dived into two parts, “Platform” and “Pipeline”. Strategic alliance with pharmaceutical companies for co-R&D with their own assets. Our DDS can be applied to various kinds of nucleic acids. 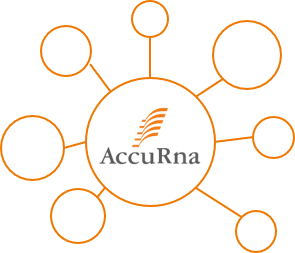 AccuRna is actively engaged in partnering discussion with pharma which enable us to accelerate the development of nucleic acid therapeutics. Incubation of in-licensed academic seeds towards the alliance with pharmaceutical companies for co-R&D. 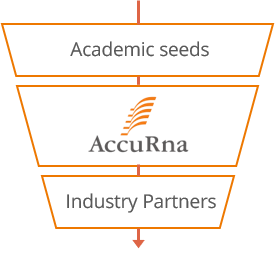 AccuRna has entered into various collaboration with academic partners to develop truly innovative academic seeds and license out to pharma that bring expertise and grobal resources to develop and potentially commerialize drugs.